Tesla is now offering a Rear-Wheel Drive (RWD) Model 3 variant in China that is significantly cheaper than the Dual-Motor and Performance versions of the vehicle. The decision for offering a comparably affordable version of the Tesla Model 3 came after almost a month of opening ordering ability for the general public. This decision might be the result of Tesla China realizing they will be able to further penetrate the market by granting cheaper options to the public. The base price for the Chinese Model 3 RWD is set to ¥433,000 ($64,300) which is ¥66,000 ($9,800) cheaper than the non-Performance Dual-Motor option available, ~$10,000 is a big amount for the majority of the Chinese population. Also by looking at the Chinese online Model 3 configurator (screenshot above), we can see the range displayed is 600+ km (~372 miles), which seems odd as the largest battery pack available in the United States offers ~310 miles (~500 km) of range, this calculation might be based on a different range testing method in China — the possibility of a larger battery pack is almost non-existent at this time. Tesla Model 3 test drives are also now available at select Tesla Stores in China since some Model 3 Performance vehicles reached the country’s shores a few days ago. Reported by our friend JayinShanghai, today was the last day of test drives offered at the Jinqiao Tesla Store in Shanghai. 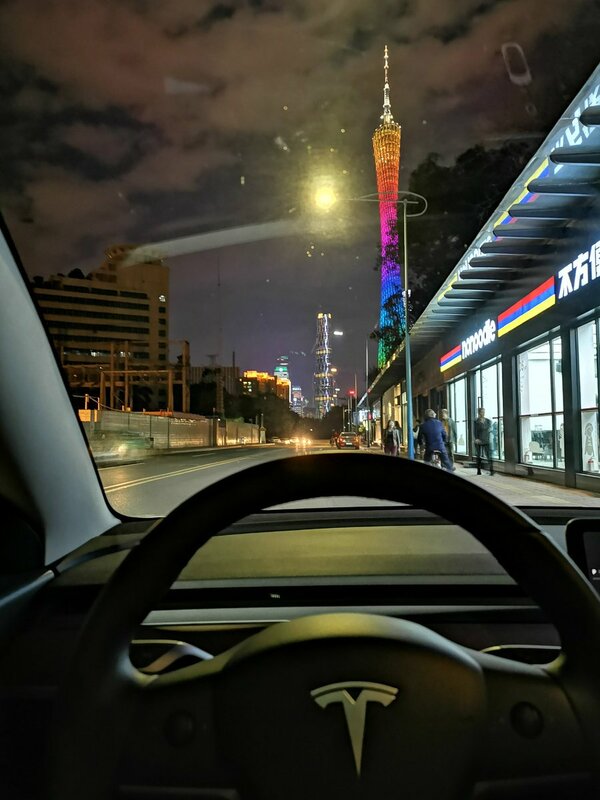 Another active member of the Chinese Tesla community 小特叔叔 (@xiaoteshushu) got a Model 3 Performance for a two week trip from Guangzhou to his home town Zhangjiajie that is around 1,000 km each side of the trip, he also got us a superb photo from inside his Tesla Model 3 of the Guangzhou city at night. Tesla’s Gigafactory 3 in Shanghai is also on a fast track of construction and development, according to the latest reports and drone footage — the Chinese Gigafactory will be supplying the local market with the most affordable base variants of Tesla Model 3 and Model Y, according to Elon Musk. Tesla Gigafactory 3 is expected to go in full production only next year — until then the Chinese Tesla customers have these upper trims of the Model 3 available to them for purchase. Hopefully, we will have more photos, videoes and updates for you from these test drives, so stay tuned!